Peterhof is the most spectacular place to see in your entire trip to St Petersburg Russia. Peterhof's Grand Palace and Park and Gardens are an hour west of St. Petersburg on the shores of the Gulf of Finland. A preeminent attraction, this grand estate was not only the summer residence of the Imperial family, it is a testament to the powerful legacy of Russia's most influential Emperor, Tzar Peter Alexeyevich or Peter the Great. Celebrated as one of the finest architectural masterpieces worldwide, Peter was inspired by the Palace of Versailles during a visit to France, so in 1709, he contracted Domenico Trezzini to build his palace in the same baroque design. It later became affectionately known as The Russian Versailles. In 1740, after Empress Elizabeth ascended the throne, she hired Italian architect, Bartolomeo Rastrelli to expand the original property in combination with the neoclassical design of the times, giving completion to the regal grandeur that Russian aristocracy is famous for. Beginning at the dramatic Ceremonial Staircase, visitors embark on a journey through the imperial world of yesteryear. Many say it's breathtaking to behold the gilded splendor in the palace's pageantry of rooms, such as The Ballroom, where masquerade balls and receptions were held and The White Dining Room, where state dinners took place. Yet it's often Peter's charming Oak Study, with its simple aesthetics, that is favored by visitors. A tour of the Park and Gardens is no less impressive, with a panorama of European landscapes manicured to perfection. But it is the Cascade of Fountains that separates these palatial grounds from all others. This world-renown ensemble of 64 fountains producing bursting sprays, cascading flows and trickling ripples through 225 statues, sculptures, masques and formations is an unprecedented achievement, with the Grand Cascade stretching from the palace all the way to the Marine canal. Visitors say they return time after time because Peterhof is their favorite attraction in all of St. Petersburg, and I like to add is one of Russia's number one tourist attractions. The name Peterhof is German for “Peter’s Court”, but the palace is often called the Russian Versailles, in reference to how the structure resembles the Palace of Louis XIV in Ile de France. The complex is now established as the Peterhof Museum-Reserve and UNESCO World Heritage Site. To learn more click on the links below or scroll down the page. The Grand Palace is a large and elegant building in Petrine Baroque style stretching for almost 300 meters. It occupies the dominant position of the Peterhof ensemble complex, connecting the Upper garden and the Lower park, in a single outstanding artistic entity. Built between 1709 and 1724 under the directions of Peter the Great, the Grand Palace was used by the tsar and tsarinas as their main summer palace.t The focal point of the whole essemble is the jaw-dropping cascade fountain leading down from the palace. A visit tho the Palace will take you into the following rooms: The Oak Study of Peter the Great,The Blue Sitting Room, The Chesma Hall, The Drawing Room of the Imperial Suite, The Western Chinese Study, The Ballroom, The Throne Room, The White Dining Room, The Portrait Hall, The Dressing Room, The Audience Room. The Audience Room (A room for small receptions for Empress Elizabeth). The Chesma Hall (A room for guests waiting for receptions to begin in the Throne Room). The Throne Room (A spacious room of gilded splendor for receptions, balls and concerts). Peterhof is also home to The Marly Palace, The Cottage Palace, the Peterhof Hermitage and Peter's original mansion, Monplaisir, which was his favorite place to withdraw and entertain his most trusted entourage. His personal art collection decorates the walls and it is rumored that Catherine personally prepared homemade meals in the cozy Dutch kitchen. These are other interesting museums worth visiting within the grounds. For more details keep reading below. Marly Palace (A private retreat built to resemble Marly Le Roi, a royal hunting lodge on the outskirts of Paris. After Peter's death in 1725, the building was refurbished in keeping with the way it was when Peter walked the halls. Many of his personal belongings are kept there). Monplaisir Palace (Peter's original mansion and favorite place to withdraw and entertain his most trusted entourage). Peterhof Hermitage (Overlooking the shores of the Gulf of Finland on its own moated island, this small building was designed to be a private and informal dining place for Peter and his closest associate). The Cottage Palace and Alexandria Park (English-style cottage and home farm belonging to Tzar Nicholas I, his wife Alexandra Fedorovna and their children). 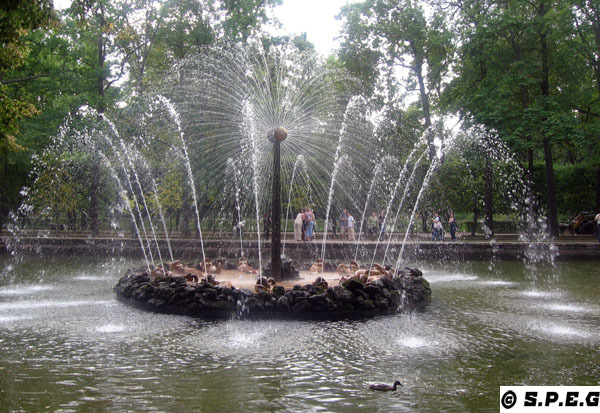 The Peterhof parks comprise two main ensembles - the Upper Garden and the Lower Park. The latter divides roughly into the central part with the Great Cascade and an alley of fountains - a canal flanked by identical small fountains, the Marly and Monplasir parks. In addition to that there is also a wide range of trick fountains of different stunning size and shape to see, such as The Samson Fountain, Oranzhereiny Fountain, Menager Fountain, the Neptune Fountain, the Sun Fountain, and the Pyramid Fountain together with the Voronikhin Colannades. Many of these fountains was designed specifically to soak visitors. You might think of the complex as being comparable to our modern water parks. The children just love it! The gangly trees in the lower garden are rigged with jets activated when someone approaches. A table within the grotto holds an artificial bowl of fruit. If you reach for the fruit, you will be rewarded with a refreshing squirt. That particular fountain was designed by Peter, himself. However, the top attraction of the whole essemble is definitely the decorative Grand Cascade, which include 225 sculptures made out of bronze, marble and lead and is considered the largest memorial of its time. Peterhof is a very popular destination, so there are many transport routes to get there from Saint Petersburg. To get there you can take a train to Peterhof from Baltiyskaya station or the bus 350, 351, 352, 356, or marshrutka 404. If you want to go by Metro you have to go to Avtovo and then go outside and take one of the following minibus also know as Marshrutka: 424, 224, 300. Instead from Leninsky Prospekt station you should take the 103. Alternatively, you can also take the Hydrofoil and travel to Peterhof across the Gulf of Finland in less than 30 mins. This option is faster and exciting, but very touristy and a bit expensive. If you choose to go by sea please remember that Hydrofoils works in the Spring only, and the museum does not allow access to the Upper Garden if you arrive at the Lower Park by water and exit the same way. A trip to Peterhof is about an hour or so by car, depending on how you travel there. If you don't want to drive yourself we recommend hiring a car with driver. This way you will travel faster, safer, and stress free. You can buy the tickets at the ticket office (not really recommended during the tourist high season), or through the official website of the museum (highly recommended). One thing to know is that there are many ticket types to buy and this can be confusing, so knowing in advance what you want to see would be crucial. You have one ticket for the Lower Park, one ticket for the Main Museum and other tickets for the remaining museums. First you need to buy a ticket outside to enter the properties. Then get on another line to buy tickets to tour the palace and the parks. If you want to avoid the hassle to buy the tickets yourself and you wish to skip the line at the entrance your best option would be to hire a tour guide, which will take care of your tickets and everything else you need for your visit. Open: Daily 10:30 am to 7 pm. Last admission is at 5:45 pm. Thursday: 10:30 am to 9 pm. Last admission is at 8 pm. Accessibility note: Partial wheelchair access is available. Free wheelchair rental is available. Accessibility note: The garden is wheelchair accessible. Make sure you wear walking shoes and dress for the weather for your visit to Peterhof. Much of Peterhof's beauty is outdoor - you don't want to miss it because you are uncomfortable. Remember that getting tickets at the main entrance can be a real problem on weekends when ticket lines can get longer. 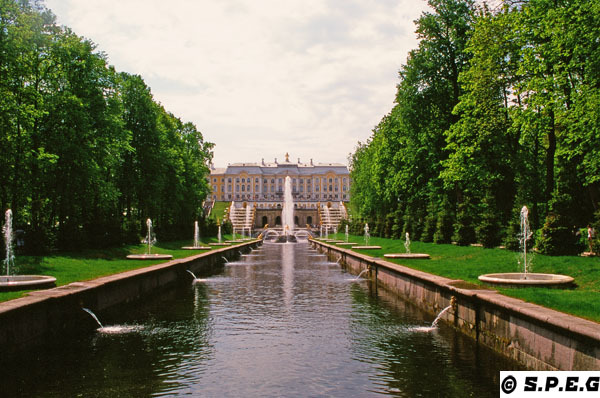 Peterhof is worth visting any time of the year but the best time to plan your visit is from late May to middle October, when the 147 fountains are turned on. The tourist high season starts in June and end in August, so if you are visiting Peterhof around this time be ready to face long queues and large group of tourists from all over the world. Book a private tour to avoid lines and secure a comfort transportation to and from Peterhof. If you want to attempt to see everything at Peterhof, go on a weekend when all the buildings are open and spend a full day. If you arrive on the hydrofoil tickets to the park and palace are available right on the dock when you arrive. If you are thinking of visiting Peterhof on your own we recommend that you go by taxi at early hours to get there around opening time to skip the lines at the ticket booths. Remember that you can buy a ticket to the Grand Palace only at the Palace itself and not at the entrance to the park. 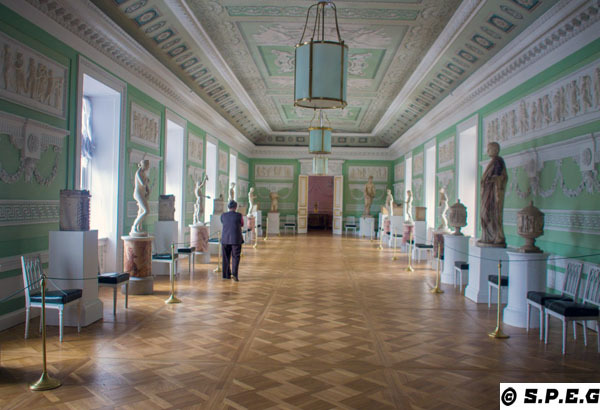 From Peterhof return to St Petersburg Attractions or go to the Homepage.